Don't pay full price for your wine - use this tips to find deals. Americans drink an average of 2.94 gallons of wine per person annually, totaling a startling 949 million gallons of wine sold in 2016, according to the Wine Institute. 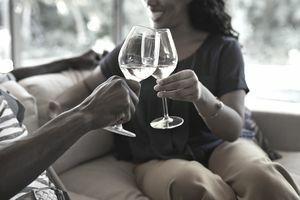 Whether you enjoy a glass of wine every evening or you just pick up a bottle before heading out to a party, you probably want to save cash when purchasing vino. By using a few simple strategies, you can minimize your wine expenditures and still enjoy some quality bottles for less. Check out these quick ideas and begin saving. When evaluating wine to purchase, some people equate certain packaging options with lower quality, but this is a mistake. In many cases, wine packaged in screw-top bottles, boxes or cans can be just as desirable as those that come in magnums. In fact, some vintners argue that screw caps can better preserve the wine inside, making for a tastier sip than wine bottles topped with cork. Boxed wine brands have also stepped up their quality and have won awards, such as Vin Vault and Black Box, often ranking ahead of certain bottled wines in competition. Therefore, if you’re on the hunt for bargain wines, it can be worth it to try a well-reviewed option that comes in a package that may not be familiar to you. Some retailers sell these wines up to 30 percent cheaper on a per-ounce basis, which can save you big down the line. Surely you’ve heard the craze about Target’s $5 California Roots wine brand or Trader Joe’s Charles Shaw offering, better known as “Three Buck Chuck.” These aren’t the only discount wines that have risen to popularity, and many of these less expensive options have been well reviewed and are quite popular. If you’ve turned up your nose at discount wines, it’s worth your time to pick up a few bottles and have a blind taste test with samples of these and your other, more pricey wines. You may be surprised to find that the quality is not so different between the $5 bottle and some of your $20 bottles, which could end up saving you big down the line if you’re able to switch to a less expensive option for your purchases. Buying wines in bulk doesn’t mean you have to pick up a giant barrel of your favorite vintage. Instead, you can accomplish your bulk purchases in a few different ways. One easy way is to take advantage of bulk discounts at local retailers. For instance, most Kroger locations offer 10 percent off of your wine purchase if you buy six bottles or more, and the chain often boosts the discount to 20 percent off during special promotion periods. Similarly, select Total Wine & More stores offer discounts off of mixed case purchases (the actual discount varies by location). You can also complete your bulk purchases by ordering your wine by the case rather than buying by the bottle, which can net you discounts of up to 40 percent off the per-bottle price. Warehouse clubs like Costco also have wines by the case for great prices. There are several websites where you can search for wines based on a variety of criteria, such as the region, type or price you’re seeking. For instance, WineZap and Wine-Searcher allow you to compare prices and get the best discounts for your wine selections. If you tell the site that you're only interested in buying wines under, say, $10, it will bring up your options and you can sort the wines by criteria such as red or white. Many of these types of sites also offer apps so you can browse your discount wine options straight from your phone. For example, try out the Vivino or Wine-Searcher app for quick price checks and to find the best discounts and deals. If you’re buying wine at a chain store, check the couponing sites like RetailMeNot or CouponCabin to see if they have any coupons, promo codes or discounts that will net you even bigger savings. For example, you’ll typically find promo codes that will save you cash at World Market, Wine.com, Drizly, Harry & David and many more. In some cases, these promo codes will need to be entered at checkout on the retailer's web page when buying online, but in other situations, you'll find that you can print out the discount coupon and present it in person when you go to a participating store.